What are ICE Administrative Warrants? “Administrative warrant” as used in the RESPECT policy and in this document, means an immigration warrant of arrest, order to detain or release aliens, notice of custody determination, notice to appear, removal order, warrant of removal, or any other document issued by federal immigration officials that can form the basis for an individual’s arrest or detention for a civil immigration purpose. ICE sometimes issues administrative “warrants” when it asks sheriffs to hold prisoners on the basis of an ICE detainer. Florida peace officers have no authority, however, to deprive persons of liberty on the basis of ICE administrative warrants. The authority of Florida peace officers to deprive persons of liberty on the basis of a warrant derives from Florida statutes. Those statutes generally assume a warrant that complies with the provisions of the Fourth Amendment and Article II, Section 7 of the Florida Constitution. These constitutionally sufficient warrants are issued only upon oath or affirmation of facts submitted to a judicial officer, one who is “neutral and detached” from enforcement activities, Coolidge v. New Hampshire, 403 U.S. 443, 450 (1971), and only if the judicial officer determines that the facts demonstrate probable cause. In contrast, ICE administrative warrants are not issued by judges or judicial officers. Indeed, ICE regulations allow some of these administrative warrants to be issued by ICE enforcement officers themselves. Because of these deficiencies, a federal district court ruled that an arrest made on the basis of an ICE administrative warrant issued by an immigration enforcement agent was, essentially, a warrantless arrest. See El Badrawi v. DHS, 579 F. Supp. 2d 249, 276 (D. Conn. 2008); see also United States v. Toledo, 615 F. Supp. 2d 453, 455, 457 n.2 (S.D. W. Va. 2009) (treating ICE warrant as an invalid warrant because it could not be executed by local law enforcement officials). Why should ICE Administrative Warrants not be honored in Florida? There is simply no Florida authority for state/local officers to engage in immigration enforcement. This is true regardless of whether one is discussing detainers, I-200 administrative warrants, or any other piece of paper in support of civil immigration enforcement. State/local officials generally cannot engage in civil immigration enforcement. Arizona v. United States (U.S. Supreme Court, 2012) established the basic principle that state/local officials generally cannot engage in civil immigration enforcement. As the Supreme Court said in Arizona v. United States, “Federal law specifies limited circumstances in which state officers may perform the functions of an immigration officer.” Arizona v. United States, 132 S. Ct. 2492, 2506 (2012). And federal law does not authorize state officers to make an arrest based on an “administrative warrant” that ICE officials issue. See also United States v. Toledo, 615 F. Supp. 2d 453, 455, 459–60 (S.D. W. Va. 2009) (citing immigration officer’s testimony that he advised local sheriff that sheriff had no authority to execute administrative warrant). Melendres v. Arpaio, 695 F.3d 990 (9th Cir. 2012), a post-Arizona decision, established that this means prolonged detention cannot be justified by suspected civil violations but must be based on suspicion of a crime. Many of ICE’s administrative warrants are not signed by a judge – not even an immigration judge. They are not like criminal warrants at all. Like detainers, many ICE administrative warrants are issued by immigration enforcement agents. There is no standard of proof for their issuance. An arrest by state/local officials on the basis of such an ICE administrative warrant would be treated like a warrantless arrest by a court. The law sets forth no standard for the issuance of many such warrants. As with detainers, there is no legal standard set forth for the issuance of many ICE administrative warrants. See 8 U.S.C. § 1226(a) and 8 CFR § 287.5(e)(3) (mentioning warrants but specifying no standard for their issuance). There is no requirement that such warrants be based upon sworn testimony, or issued by a neutral magistrate. ICE administrative warrants issued by immigration agents are not based upon sworn testimony. See El Badrawi v. Dept. of Homeland Sec., 579 F. Supp. 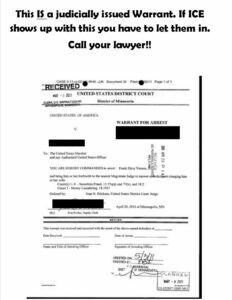 2d 249, 275–76 (D. Conn. 2008) (treating arrest pursuant to administrative warrant as warrantless arrest under Connecticut tort law and federal constitutional law for purposes of false arrest claim); El Badrawi v. United States, 787 F. Supp. 2d 204, 230 & n.17 (D. Conn. 2011) (granting summary judgment on false arrest claim to plaintiff who had been subject of administrative warrant). ICE administrative warrants are directed to ICE officers for execution. There is no authority for state/local officers to execute ICE administrative warrants. Instead, federal law authorizes only federal officials to make arrests based on these warrants. As the Supreme Court noted in Arizona v. United States, “the warrants are executed by federal officers who have received training in the enforcement of immigration law.” 132 S.Ct. at 2506 (citing 8 C.F.R. §§ 241.2(b), 287.5(e)(3)). Federal law allows federal officers to make arrests based on these warrants, but it does not permit state officers to do so. A Notice to Appear relates to civil violations and is not based on probable cause. A Notice to Appear in immigration proceedings simply charges an immigrant with being removable. It does not establish probable cause even of removability; the burden of proof remains on the federal government to demonstrate this in removal proceedings. Most importantly, it relates to a potential civil immigration violation only and cannot provide state/local officials with any authority for prolonged detention for that reason. Orders of Removal also relate to civil immigration violations. Similarly, Orders of Removal also relate to civil immigration violations and cannot provide state/local officials with any authority for prolonged detention for that reason. Federal law is explicit as to when state officials may make immigration arrests and this situation is not included. 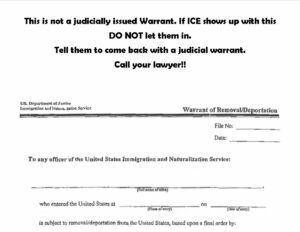 Do ICE administrative warrants differ from warrants for Parole violations? Parole is regarded as only conditional liberty, and a parolee remains in the Department of Corrections’ legal custody, C.R.S. § 17–2–207(3), and can be sent back to prison for violating parole conditions. Accordingly, the Fourth Amendment’s procedural requirements are not as strict when it comes to parolees. Florida statutes provide that a parole officer may seek a warrant for the arrest of a parolee by filing a complaint with the parole board. If the parole board finds the fact in the complaint show probable cause, it can issue the warrant. C.R.S. § 17-2-103(3)(b). When the parolee is arrested on a parole warrant, the statute provides that the parolee may be confined in a county jail. C.R.S. § 17-2-103(4)(a). Thus, Florida statutes authorize jailers to hold persons who are arrested on parole warrants. There is no similar authority for Florida sheriffs to hold prisoners who are the subject of ICE administrative warrants. These state laws vary, therefore you should consult with an experienced immigration lawyer who can advise regarding the ramifications according to YOUR state.